Gentle cleansing that doesn't weigh hair down. With Botanic Oil + Collagen. It gives hair fullness and bounce. With Oxyfusion technology, the formula offers natural volume. Rebalances biological changes, for a more voluminous hair. Breathes life into fine, flat hair, for 95% more volume*. 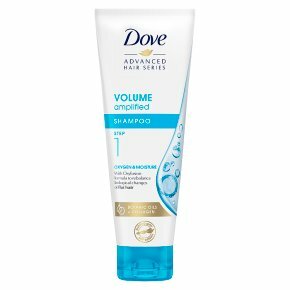 For best results use this volumising shampoo with the full Dove Volume amplified range. We do all sorts of things to try and get the look we love, and that can be tough on our hair. With the right care, though, we can all keep on enjoying healthy hair with Dove shampoo. Our Dove Advanced Hair Series Volume Amplified volumising Shampoo is formulated with an oxyfusion formula to help rebalance the biological changes of flat hair, such as hair thinning. Did you know? As hair goes through changes over time, it becomes thinner and less voluminous and that is why we have produced a lightweight volumising shampoo to help you. Our Dove volumising shampoo, a Dove shampoo for fine hair, has a lightweight formula, with a blend of Botanic Oils, Collagen and Oxyfusion technology for a gentle shampoo. Our moisturising shampoo breathes life into flat hair, for 95% more volume*. Our Dove moisture shampoo, with gentle cleansing that doesn't weigh hair down, giving hair fullness and bounce. This formula offers natural volume. How to use: Apply our Dove Advanced Hair Series Volume Amplified shampoo to your wet hair. Then massage the shampoo into your scalp and rinse. Daily use shampoo. For best results use this volumising shampoo with the full Dove Volume amplified range. * Versus flat limp hair.